It’s hard to believe the final race of the year has come and gone. What a season! There were of course ups and downs, but overall it was a great season. Three years ago when I started riding a bike, racing seemed like a crazy idea. I certainly didn’t ever think I would make it beyond the beginner’s category in any discipline if I did give it a try. I’m proud to have proved myself wrong and have earned an upgrade to Category 1 for Cross County Mtb, and Category 3 for Road and for Cyclocross. It’s been an incredible journey with a lot of hard work, but I can’t begin to express how rewarding it has been. I discovered an entirely new community, a cycling community that is warm, welcoming, and encouraging. I’ve met so many cool people and have made great new friendships. I’m already anxiously waiting next year’s race season to begin; I can’t wait to see where it takes me! Getting to watch the Belgians race in person and watching Sven Nys take the win in front of a roaring crowd was pretty magical, but even that was not the highlight of the day. The most special moment for me was getting to meet Emily Batty in person! I saw her in front of the Trek tent and stopped dead in my tracks and had to ask Aaron if that was really her. I went up to chat with her and she was nicer than I could have imagined and took the time to genuinely chat with me. I made sure to thank her for being such an inspiration for women. I was nervous about taking too much of her time, but she just kept chatting and really talking with me. Thank you Emily for making my day! The finish of the crit came down to a 3 way sprint. I came in 3rd and my teammate Alijah in 1st, I was just so incredibly happy to have been in the mix. And it was the finish to a great Omnium weekend. I think endorphins were kicking in big time! This was my first race after upgrading to a Cat. 1 for Cross Country. Lining up next to a bunch of really talented ladies, some with Pro licenses was almost surreal. I really never expected I would get this far. Not even a mile into the trails, hearing my nephew exclaim “I can really see why you like mountain biking so much” was music to my ears. It was a proud moment to be able to share something I love so much with my nephew. 6. 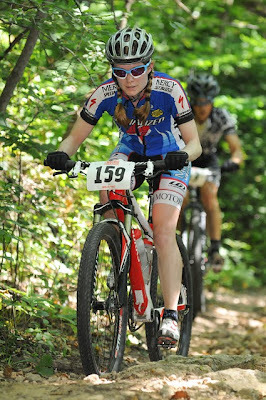 Getting an Elusive Win in a Cat 1/Expert Mtb Race! I was ecstatic to be able to podium several times in mountain bikes races this year, and I dreamed about being on the top step, but couldn’t ever quite get there. At Mattheissen, I was having a really good race and was in the lead, thinking I might actually get a win, when I sheared off my derailleur. I didn’t even crash, just got too close to a downed tree limb, and DNF’d. I was starting to think that I just didn’t have it in me this year. I went into Mud, Sweat, & Gears with a lot of determination, but no expectations. I pushed myself every second of that race and finally got my first cat 1/expert win! This little guy is obsessed with bikes. He LOVED watching the bikers at the Chamois Time Crit, getting excited every time they would come around. I’ve been told he has also tried jumping out of the shopping cart at Target while going past the bike section! I knew he had to have one. He still can’t quite reach the ground with his feel while sitting on the saddle, but I’m determined to take him to Sugar Bottom for the novice loop in the spring. He’s mastered walking, so why not mountain biking next?! This was a great year for both of us. We were able to feed off each other’s motivation and hard work, pushing us both to put more effort into improving than before. I had a feeling Aaron might be asked to the team, but was thrown for a loop when I got my asked myself! I hope you all had a great race season! What were your favorite moments of 2013? Congrats on an amazing year Emily!! 2014 should bring a whole new level of awesomeness for you! !